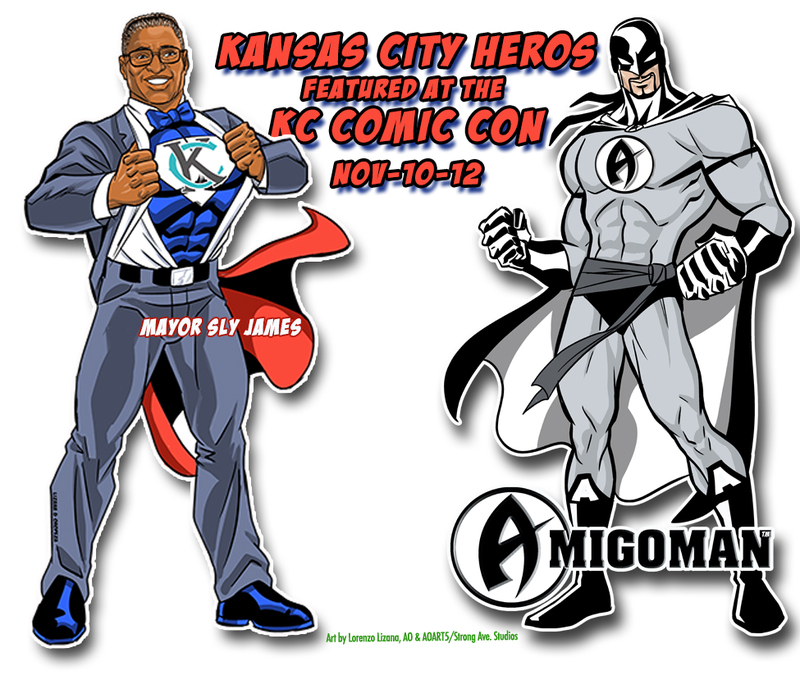 AO’s AMIGOMAN™ was asked by the KC COMIC CON of 2017 to be one of the KC HEROS along with the KCMO Mayor Sly James. KC native and comic book creator Anthony AO Oropeza is slated to be at the KC Comic Con November 10-12. He will both comic book and prints of his sports and fine art displayed and for sale. He will also be available for original sketches and discuss and schedule future school visits with teachers and librarians that attend. [VIDEO LINK] Kansas City Mayor Sly James on Friday was presented an 8-foot-tall cut of himself as ‘Super Mayor James’ created by local artist Anthony ‘AO’ Oropeza and organizers of Kansas City Comic Con (KCCC). The cutouts, made to celebrate the upcoming Kansas City Comic Con, surprised James in his office Friday at City Hall. “Great smile on that guy, I wish I had his teeth, the chiseled jaw, kind of looks like me,” said James. The “Super Mayor James” and Amigo Man figures will travel to various locations around town in the coming week prior to Kansas City Comic Con convention being held Nov. 10-12, 2017 at Bartle Hall.